Note: Frustrum was commissioned by and first exhibited at Fondation Cartier pour l’art contemporain, Paris, France, 2006 - 07. 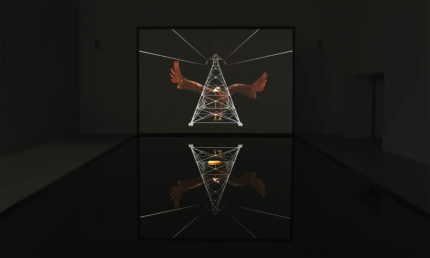 Frustrum is a mixed-media installation consisting of a large-scale high-definition video projection of a computer-generated eagle that exhibits subtle human-like qualities (screen is approx 12 h. x 20 w. ft. [3.66 x 6.10 m.]). The bird is seen trapped in a pyramidal shaped electrical pylon complete with transmission lines that “draw” the iconic view of exaggerated perspective out to the corners of the screen. 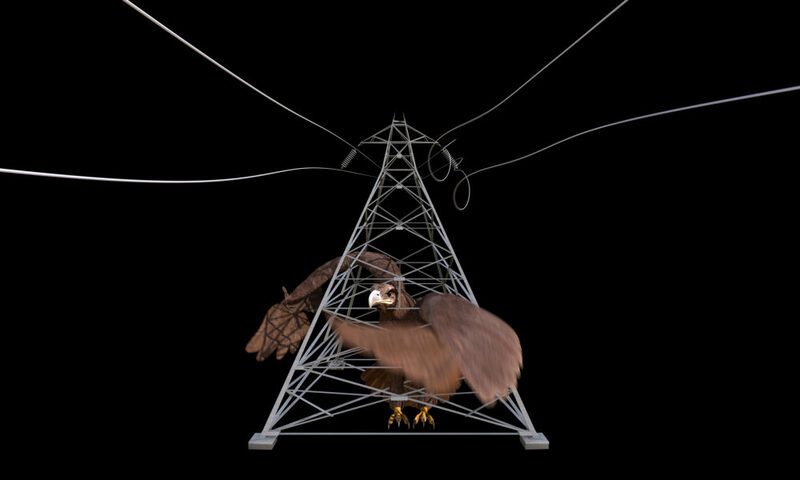 Intermittently the eagle vigorously flaps its wings which at times disturb the wires (lines of perspective). On the floor in front of the image (and reflecting the image) is a low profile pool of black oil having the appearance of a deep pit (approx. 23.5 ft. x 33.5 ft. x 10 in. deep [716 x 1,021 x 25 cm.]). The container is slightly skewed to a trapezoid shape (another frustrum), canceling out what otherwise would be the viewer’s natural view of perspective of the container. 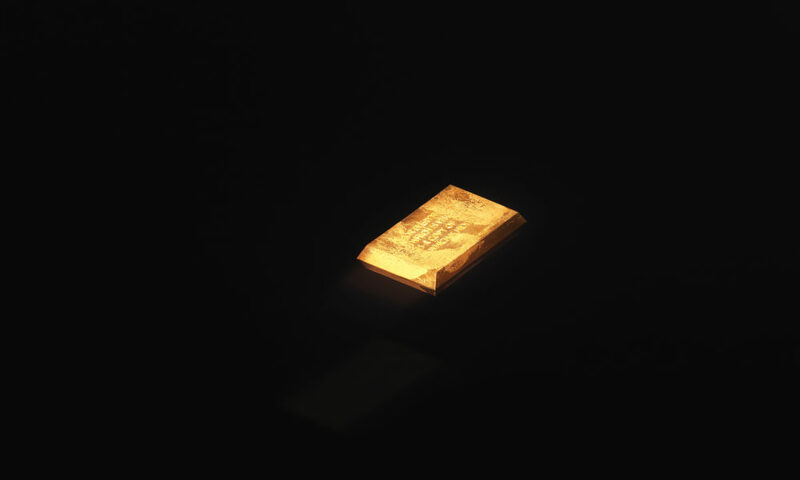 In the middle of the pool is a rectangular “brick” of 24 carat pure gold again in the frustrum shape (approx. 1 h. x 12 x 7 in. [2.5 x 30 x 18 cm.]). Engraved on its surface is the sentence, “FOR EVERYTHING WHICH IS VISIBLE IS A COPY OF THAT WHICH IS HIDDEN.” Coinciding with the aggressive movement of the bird’s wings against the taut power lines (of perspective) are the sounds of cracking bullwhips that reverberate loudly in the space. When the wings dip below the lower edge of the screen/image meeting their reflections in the pool, invisible “ripple generators” are triggered and the oil is subtly disturbed, rippling the image reflection. A ceiling-mounted video camera monitors a full screen image of the brick of gold which is displayed on an LCD/plasma screen elsewhere in the space. 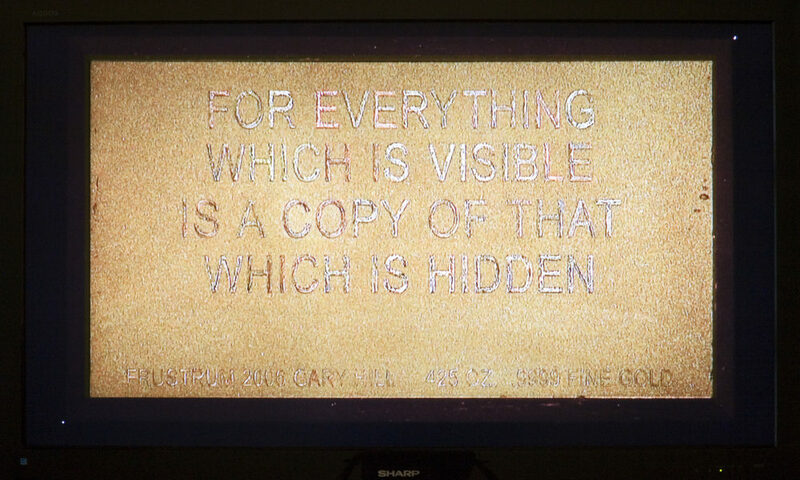 “Gary Hill,” Fondation Cartier pour l’art contemporain, Paris, France, October 27, 2006 – February 4, 2007. Solo exhibition. Gladstone Gallery, New York, New York, January 13 – February 10, 2007. “Gary Hill: Frustrum,” Art Cologne, Cologne, Germany (special installation organized by IMAI, Dusseldorf, in collaboration with Fondation Cartier pour l’art contemporain, Paris), April 17 – 22, 2007. Solo exhibition. Louise T. Blouin Foundation, London, England, June 22 – August 30, 2007. “Gary Hill: Strange Trajectories,” NRW-Forum / IMAI (Inter Media Art Institute), Dusseldorf, Germany, September 15 – October 28, 2007. Gary Hill / Gerry Judah. Paris: Somogy Publishers / LTB Holding, Ltd., 2007. Quasha, George and Charles Stein. An Art of Limina: Gary Hill’s Works and Writings. Barcelona: Ediciones Polígrafa, 2009, pp. 209, 373, 380 – 388, 389, 395, 506, 575, 579, 600. Gary Hill:o lugar sem o tempo / taking time from place. Rio de Janeiro: Contra Capa Livraria / Mag Mais, 2009, p. 94 (photo). 100 Video Artists. Madrid: EXIT Publicaciones – Rosa Olivares y Asociados S.L., 2010, pp. 30, 218 – 221, 459. Text by George Quasha. Gary Hill: Viewer. Moscow: GMG Gallery, 2010 (in Russian and English), pp. 38, 39. L’OR dans l’art contemporain. Paris: Flammarion, 2010, pp. 194 – 196. In French.